Queensland's first railway line was built between Ipswich and Grandchester, and it opened in July 1865. A rail connection between Ipswich and the state's capital wasn't possible until a bridge was built across the Brisbane River between Chelmer and Indooroopilly. That happened originally in 1876, but it had to be repeated in 1894 after floods damaged the first bridge. 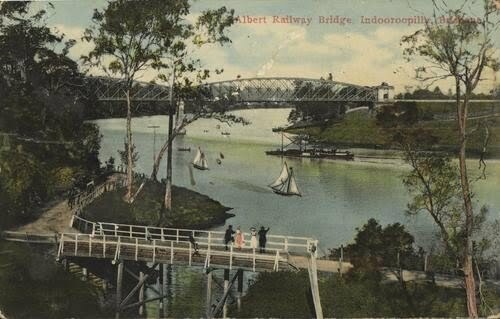 Here is a colour postcard showing the second bridge, from around 1911. Both rail bridges were named the Albert Bridge in honour of the Prince of Wales, Prince Albert. The second bridge was designed by engineer Henry Charles Stanley, the Chief Engineer of Queensland Railways. He was the brother of Colonial Architect FDG Stanley, who has also left a legacy around the state. The bridge took some time to complete, mainly owing to strikes overseas, and it did not open to traffic until 1895. Henry Stanley must have taken a liking to that part of the river, for he had his brother design a riverfront home near the bridge. Henry lived in that house Tighnabruaich from its completion around 1889 until 1891. A current photo of the bridge is shown below. The increase in rail traffic as Brisbane's western suburbs expanded meant that a second rail bridge was needed, and it was built upstream of the first in 1957. It is known as the Indooroopilly Rail Bridge. The photo above shows one of Queensland Rail's electric trains in the process of crossing the Albert Bridge. This site now has four bridges side by side - the Walter Taylor Bridge, the Indooroopilly Rail Bridge, the Albert Bridge and the Jack Pesch Bridge. The photo below shows the bridges, and the house in the top left corner is Henry Stanley's former residence Tighnabruaich, which is now heritage listed. The Jack Pesch Bridge is a pedestrian and cycle bridge erected on the downstream side of the Albert Bridge (top bridge in the photo above - it has a tall steel tower at each end). The Walter Taylor Bridge provides for only two lanes of traffic, and is a severe bottleneck for traffic in this western corridor. One would imagine that it would need to be replaced at some point in the future. It will be a real jumble then!